EA hosted a livestream earlier today in which they showed off quite the reveal for the Battle of Jakku map, which will be available as free DLC tomorrow for everyone that pre-ordered Star Wars Battlefront. The trailer below is a summation of todays livestream. The Battle of Jakku – Kind of like Tatooine, but with more AT-AT and explosions. 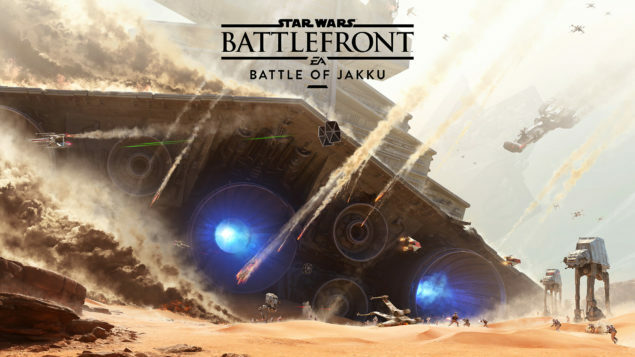 The Battle of Jakku DLC map will arrive tomorrow with a new game mode, called Turning Point. Turning Point is a mode in which the Rebel Alliance must find and take control of Imperial held bases. You’ll be able to take part in infantry based combat, fly speeders and even control walkers, as the Imperials. The larger Battle of Jakku will rage on above and around you, with debris falling from the sky, even a Super Star Destroyer eventually slamming into the planet. The trailer itself is almost entirely in-game and shows a tremendous amount of actual gameplay as well. The terrain, unsurprisingly, is very much akin to what we’ve seen in Tatooine. These two locales feature similar barren landscapes. The action on Jakku will apparently be near constant and relentless. The Battle of Jakku happens 29 years before the events of Star Wars Episode VII: The Force Awakens and is a pivotal moment for the Rebel Alliance. This map is a tie-in to the movie, letting gamers everywhere take place in an event whose aftermath we’ll see on December 18th, when The Force Awakens hits theaters. Those that sought to pre-order Battlefront will find the DLC available to them tomorrow, while everyone else will have to wait until December 8th in order to partake in the grim action. Star Wars Battlefront is still chastised for its lack of a single-player campaign as well as a lack of variety that might limit its exposure to an otherwise larger audience. Star Wars games are prized for their story and ability to place you inside the vast and troubled galaxy far far away. Star Wars Battlefront was initially very fun, though it might not be able to maintain that momentum indefinitely.